MEATCHUNK ENTERPRISES,INC.© was first known as meatchunk recordings, a small experimental record label formed sometime in 1993. Although nothing was ever sold or mass produced, many sound collage prototypes were recorded on cassette tape and later on compact disc. The MEATCHUNK ENTERPRISES,INC.© name first appeared printed on a free Musician's Friend catalogue sent to founder Andrew Schell's home. Little did he know what he had started when he jokingly filled out an address card to mail order a microphone. Fast forward five years and MEATCHUNK became synonymous with improvised tools and repairs. Many objects have donned the official MEATCHUNK Sharpie© black marker imprint over the years, such as the original HANDEE-STIK©, little known CUSTOM BIKE CHOPPER© parts, and so much more. The discovery of PATENTED O.S.B. TECHNOLOGY© and its application on the ubiquitous POWERTROOPER© led the company in a new direction including shipping and logistics thru the TRUCKIN USA© division as well as early prototypes of the MOBILE JAM UNIT©. These important breakthroughs allowed MEATCHUNK ENTERPRISES,INC.© to create new, exciting products and services that would become the basis for what you see in this store today. 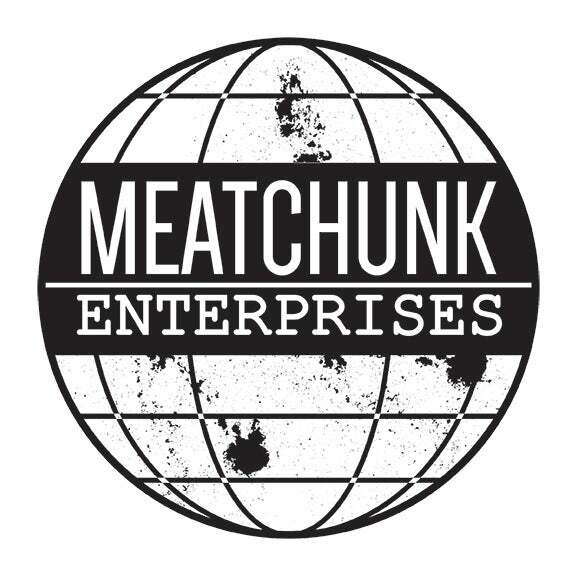 MEATCHUNK ENTERPRISES is currently based in the Kansas City Metro Area. An art gallery and store will be opening later this summer in Frankfort, Kansas. Stay tuned for more details and new products! All items will be shipped through USPS. Once shipped most domestic orders take anywhere from 2 to 10 business days to arrive depending on the efficiency of your local postal service. Notify me with your order if you would like other arrangements to be made for shipping. Extra cost may apply.